UPDATE – Coming Soon: A Haunted Review and Giveaway! I’m super excited to announce to you all today that there will be another giveaway coming up on The Hand-Written Life next week! 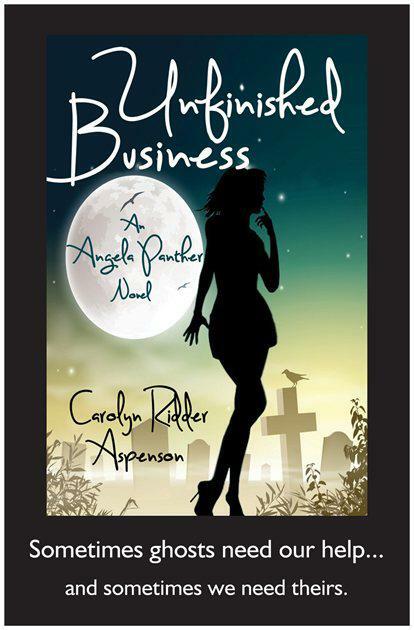 In addition to reviewing a copy of Unfinished Business by Carolyn Ridder Aspenson, I also have two e-copies of the novel to give away to two lucky readers – just in time for Halloween! If you’re a fan of mysteries like I am, and if you’ve enjoyed my What I’m Reading posts, then this is the perfect giveaway for you. Check back starting with my review of the book Tuesday, October 15th, then enter to win as many times as you want until 1am on the 16th*! The winners will be announced around 11am (pacific time) on Wednesday the 16th. Yes! This is going to be a SHORT giveaway! So don’t forget to enter, and be sure to tell your friends – because not one, but two copies, are up for grabs! *The original version of this post announced the review and giveaway would start on the 11th of October and run until the 15th. For more information on current, upcoming, and past giveaways hosted by The Hand-Written Life, please visit our giveaway page by Clicking Here. Or find her on Amazon , today! ← Quoted – Happy October! I’ll have to check this out. I do love a good mystery! I’ve been curled up with the book all weekend (recovering from pneumonia), and I am really enjoying it so far! I’m excited to be able to share it with you all!